German airships resume bombing raids in the United Kingdom. Zeppelins of the Imperial German Navy scatter bombs on East Anglia and the English Midlands. Casualties number 183; 70 dead and 113 injured. 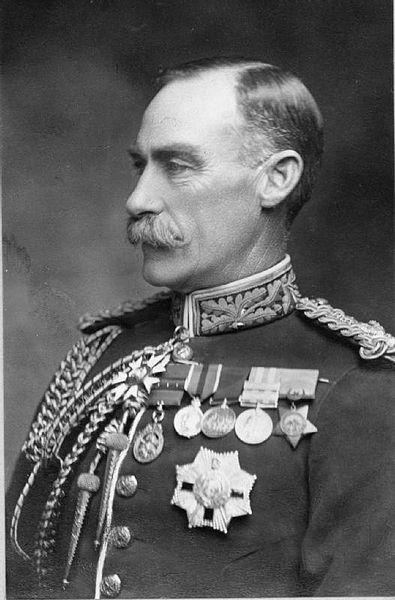 General Sir Horace Smith-Dorrien resigns as Commander-in-Chief of British forces in East Africa. 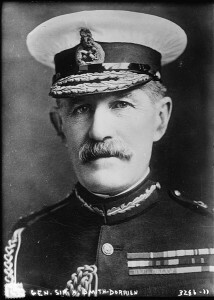 Smith-Dorrien was appointed in November 1915 but was unable to assume command, having contracted pneumonia during the voyage to South Africa. He was replaced by General Jan Christiaan Smuts. General Sir Horace Smith-Dorrien. Image courtesy Bain News Service. Reveille 6 a.m. on parade 6.45 a.m. Roll call, orders read out and gargle, then fell out and went on duty at hospital. Breakfast at 8 a.m. cleaned up and dressings etc followed after which had spell till dinner time. After dinner dressings and foments again and wrote a letter before tea. A 14th Battalion man killed in town accidently by Military Policeman. He was drunk, name Thornton. Four battleships in lake today, aeroplanes flying about all the time. Went to the Church of St John in the Wilderness this evening, large congregation, mostly soldiers. Back in camp and in bed before lights out 10 p.m.
George Edward White was born in Orange on 12 June 1886. He was the third child of George Henry White, bookbinder originally from Southampton, England and Margaret Elizabeth Stanmore. He grew up in and around the gold mining villages of Euchareena and Farnham in New South Wales where his father had been mining for gold along the Macquarie River until his death in 1898. 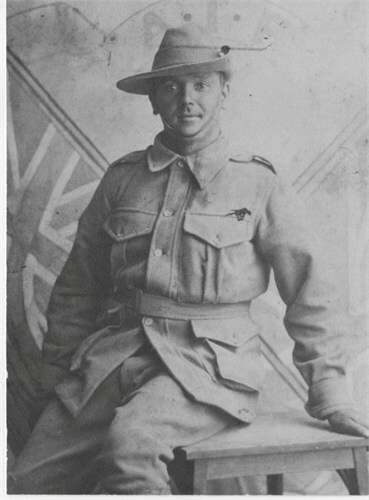 George White enlisted on 28 September 1914 at Rosehill in Sydney and was assigned to the 13th Battalion. He gave his occupation as labourer and his next of kin as Margaret Elizabeth White, his mother, who was now living in Orange. George embarked at Melbourne on HMAT A38 Ulysses on 22 December 1914 but returned to Australia again on 4 May 1915 via Ceramic for medical treatment. He was discharged from Langwarrin in Victoria and returned to duty at Broadmeadows, Victoria. On 14 March 1916 he was found to be Absent Without Leave (AWOL), and declared a deserter on 10 May 1916. According to Army protocol he was not issued with medals for service in WW1. George married Sylvia Ellen Jackson in Morwell Victoria on 24 March 1916 and they had four children: William, Marjorie, Henry and Gwendoline. George died at the age of 57 and according to his obituary, was a keen sportsman, especially cricketer, who could boast to having taken eight wickets for two runs. George Edward White was buried at Hazelwood cemetery in Victoria together with his wife Sylvia who died in 1977. Morwell Advertiser, 15 June 1944, p. 1. 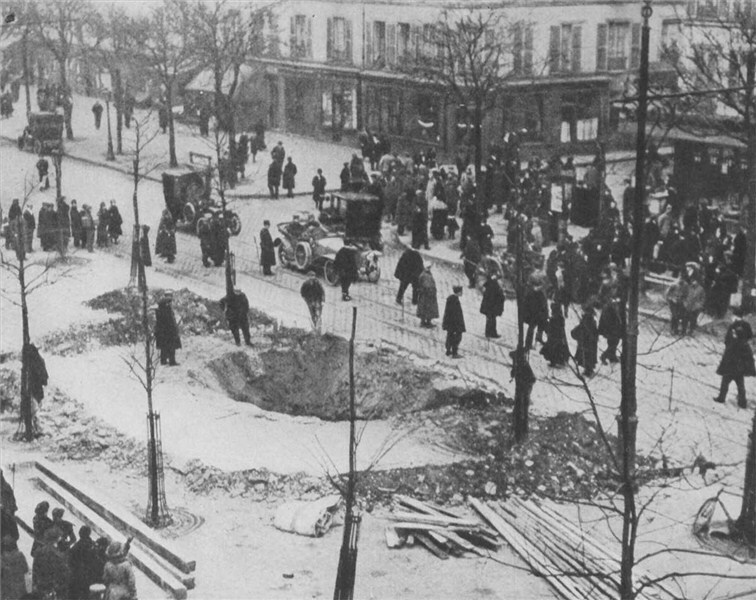 Crater of a zeppelin bomb in Paris. Image in public domain. Enlist to-morrow—not the day after. Don’t skulk while your brother bleeds. Don’t wait and jackal the other man’s job. Let posterity point to you as a patriot. If the women turn down the skulker and shirker we will win the war. If not, every shirker in the time of war is assisting Germany. 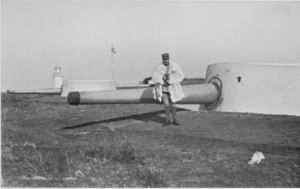 Allied forces occupy the fortress of Kara Burun in Salonika; the Greek Government protests, declaring that the occupation violates the written agreement between the Greek Government, the Greek General Staff and General Sarrail. 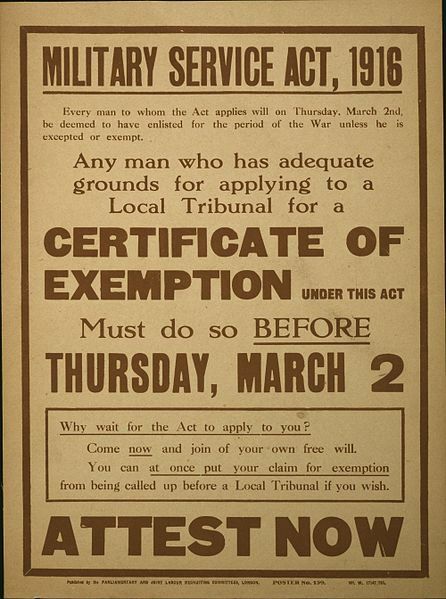 The Military Service Act comes into effect in Great Britain, imposing conscription on all single men aged 18 to 41. Exemptions are made for men in essential war work, those declared medically unfit, religious ministers, and conscientious objectors. Within a few months conscription is rolled out for married men. 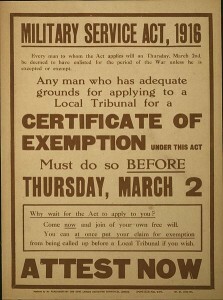 The period of conscription remains in force until 1919. The battle cruiser HMAS Australia participates in a squadron sweep of Norwegian waters in the vicinity of The Naze. No enemy vessels are encountered. A French airship drops 38 bombs on the railway station and military establishments at Freiburg in Germany. 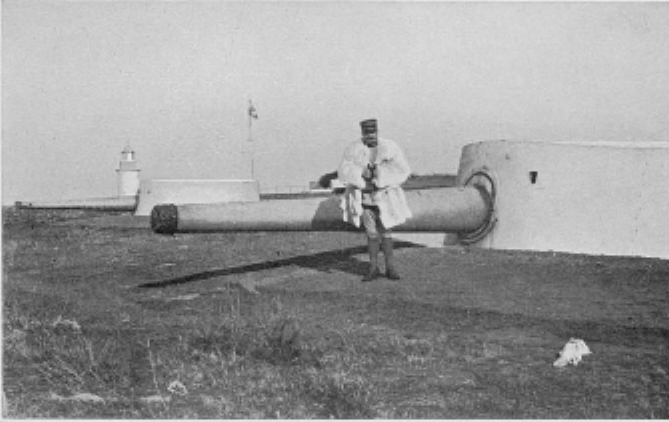 The action is a reprisal for the German attack on Dover on 22 January. It is the first time that the Allies have employed a dirigible in a raid; until now they have been used for scouting and reconnaissance. Prime Minister Billy Hughes departs Australia for consultations in New Zealand, Canada and London. His trip to England is ostensibly for discussions on the intentions of Japan in the Pacific, but while there he urges the application of greater economic pressure on Germany and argues for greater Australian involvement in determining the conduct of the war. Hughes spends three months in Europe and visits Australian troops in France. 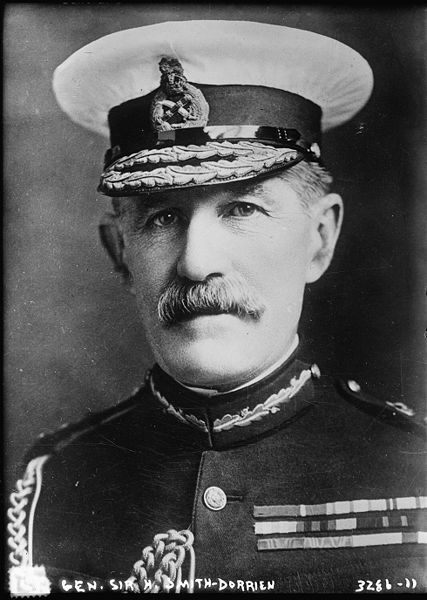 General Sir Percy Lake, 1914. Image courtesy Imperial War Museum. William Henry Bright enlists. William is commemorated on the Centenary of WWI in Orange Honour Roll; he would die of disease in France on 24 February 1917. Norman George Goode enlists. Norman is commemorated on the Centenary of WWI in Orange Honour Roll; he would be killed in action in France on 3 May 1917. Clive Allen Glasson enlists. Clive is commemorated on the Centenary of WWI in Orange Honour Roll; he would be killed in action in Belgium on 16 July 1917. 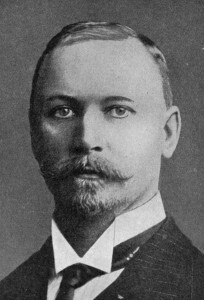 General Jan Smuts c1915. Image in public domain. Norman Thomas Trethewey enlists. Norman is commemorated on the Centenary of WWI in Orange Honour Roll; he would die of wounds in Belgium on 30 October 1917. Norman Thomas Trethewey. Image courtesy Graeme Trethewey. Norman Thomas Trethewey was a young carpenter/joiner from Orange in N.S.W when he joined the First Australian Imperial Force on 24 January 1916. He was the seventh child of nine in the family of Robert and Bessie (Thomas) Trethewey. Robert and Bessie had emigrated from Cornwall and arrived in Port Jackson on 4 April 1884 aboard the ship Cambodia. They immediately went to Orange N.S.W where Robert was to work on Bessie’s uncle’s (Tom Hawke’s) orchard. Norman’s older brother – Robert Stanley (Stan) – was one of the first to sign up for overseas service when war was declared in 1914. Stan had been a member of the New South Wales Militia for five years – in the last year serving as a member of the Light Horse. When he enlisted on 22 August 1914 he was aged 26 years and was allocated the Regimental Number – 440. Stan became a member of the newly formed 1st Light Horse Regiment and embarked for Egypt aboard the Star of Victoria on 20 October 1914. He served in the Gallipoli campaign returning to Egypt in December 1915. 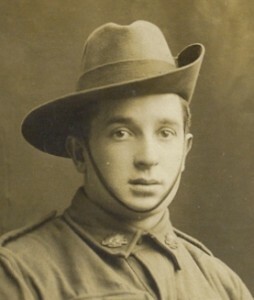 Young Norman was no doubt influenced by his older brother’s adventures and the newspaper reports of the diggers’ “glorious withdrawal” from the Gallipoli Peninsula. Having served, as an infantry soldier in the Militia for four years, Norman was no doubt eager to “Serve King and Country” and embark on the adventure of a lifetime. He travelled to Sydney and enlisted in the 1st A.I.F at Victoria Barracks on 24 January 1916. Norman had celebrated his 20th birthday on 6 January 1916. Norman misrepresented his age on his enlistment papers by indicating he was 21 years of age. Being under the age of consent Norman needed the permission of his parents to serve his country. The Parental Consent section of his enlistment paper was not completed by his mother and father. He also listed his mother as his Next of Kin and not his father which seems unusual for this era. And so Norman, like many other thousands of young men, joined the A.I.F, under age, and without parental consent. It could be assumed that his enlistment would have caused anguish for his parents whom it would appear were reluctant to give their consent as I am sure he would have asked them prior to 24 January 1916. Enlistment details on Norman Trethewey describe him as a carpenter/joiner having served a five year apprenticeship with Mr T Eslick (probably a relative) of Orange N.S.W. Norman was single, 5 foot 7 ½ inches tall (good Cornish stock), 140lbs in weight, hazel eyes having a fair complexion and dark hair. His religion is shown as Methodist (his family was instrumental in establishing the Methodist religion in Orange). He was “taken on strength” with the 2nd Reinforcement Unit (1st Pioneers) at Casula N.S.W and was posted to C Company Depot at Bathurst where he remained until 8 March 1916 at which time he transferred to the 13th Engineers Bathurst. Norman was posted for overseas service and departed Sydney on HMAT A40 Ceramic on 14 April 1916. After a short time in Egypt he sailed for England and arrived in Plymouth on 11 June 1916. On 18 June he was posted to “On Command” to AIF Headquarters at Tidsworth where he remained for some time. He was transferred to the Pioneer Training Unit at Larkhill on 17 March 1917, and then to the Pioneer Detachment at Parkhouse. 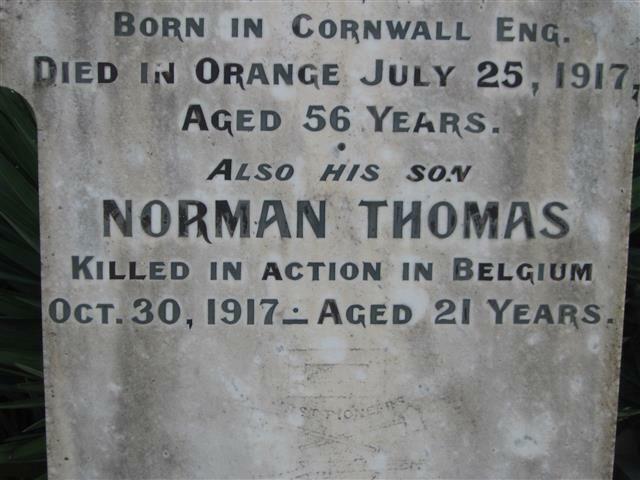 It should be noted that Norman’s father Robert died in Orange on 25 July 1917. Service on the Western Front beckoned and Thomas departed Southampton for France as a reinforcement on 9 October 1917, arriving at Havre on the 10th. He was “taken on strength” by the 1st Pioneer Regiment and joined the unit on the front line. The Regiment was operating, at the front, around the battlefield at Ypres. Regimental HQ was located in a Belgian Chateau with the unit’s four companies billeted nearby. At the time Norman arrived on the Western Front the Australian Corps had been engaged in the 3rd Battle of Ypres from the beginning of August 1917. The Australians had taken part in the battles of Broodsheinde, Pocappelle and the 1st Battle of Passchendaele. The 1st Battalion Pioneers also took part in the 2nd Battle of Passchendaele from 26 October until the capture of Passchendaele village on 6 November 1917. During October 1917 the 1st Pioneer Battalion was involved in various tasks around the Zonebeke area of Ypres. Work was undertaken on road and track construction, duckwalks, erection of notice boards, communication trench construction, railway and tramways and artillery dugouts. All of these activities were undertaken by the battalion’s four companies whilst under constant artillery fire from the Germans. Landmarks mentioned in the battalion’s war diaries include Westhock, Smith Road, Garter Point, Dicanville Railway, St Josephs, Kit Kat Track and Moulin Farm. It is interesting to note that Australian units in the area were returned to Australian Divisional control on 24 October 1917. The 1st Pioneer Battalion’s war diary does not indicate in which of its four companies Norman served, nor in what frontline area he was working on 28 October 1917. It was on this day that Norman Thomas Trethewey was listed as “wounded in action” and he was transferred to the 2nd Australian Field Ambulance Unit. He died from his wounds on 30 October 1917. His family was sent the standard notification letter that he had been “wounded in action” by Base Records Office Victoria Barracks Melbourne dated 9 November 1917 – nine days after he had died. It was during the 3rd Battle of Ypres (Passchendaele) that the German Forces used mustard gas instead of chlorine gas. This resulted in a large number of allied casualties suffering severe chemical burns. Norman’s war records contain a copy of a Field Service Report on the Death of a Soldier. This report states that “he died of wounds received in action” on 30 October 1917 – see Special Death Report dated 31 October 1917 – there is no special death report in his records. It could be concluded that Norman had been a victim of mustard gas? Exactly when Bessie Trethewey and her family were notified that Norman had died is not known, however, given the delays in communication at the time it is reasonable to assume that they were informed sometime in December 1917. Copies of correspondence concerning the wounding and subsequent death of Norman are contained in a copy of his Personnel Record obtained from the National Archives of Australia. The correspondence deals mainly with the whereabouts of his personal effects – his pay book, will, death certificate and Honours and Awards. Bessie Trethewey also sought legal assistance to recover these personal effects and engaged Garland, Seaborn and Abbott Solicitors of Sydney to deal with A.I.F Base Records Office at Victoria Barracks Melbourne. Norman’s remaining personal effects were located at the A.I.F kit store in Fulham England on 2 April 1918. His possessions included one pocket book, photos, one letter, one purse, and a cheque drawn on the Bank of New South Wales (cancelled). These items were dispatched to Australia aboard Barunga on 21 June 1918. The Barunga was sunk, when torpedoed, off Land’s End, Cornwall, on 15 July 1918. Norman’s identity discs were located and sent home on board the merchant ship Toromoe on 18 October 1918 but no evidence remains that the I.D discs were ever received. The records also provide information of the Honours and Awards sent to Bessie from The Australian Imperial Force. She received a Memorial Scroll and a pamphlet – Where the Australians Rest on 14 February 1922, a Memorial Plaque (often referred to as a “dead man’s penny”) on 18 October 1922, the British War Medal on 1 January 1922 and the Victory Medal on 1 March 1923. The only item remaining in the family possession is the Memorial Plaque which was given to his great nephew, Graeme Trethewey, by Norman’s youngest sister, Ella, in 1992. Norman has no known grave and he is one of many thousands of soldiers who rest in unknown fields in both Belgium and France. The name of Norman Thomas Trethewey (Carpenter) from Orange New South Wales is inscribed on The Ypres (Menin Gate) Memorial in Belgium – Memorial Register No 29. The Menin Gate memorial is located in the Ypres Salient in Belgian Flanders. The Memorial is inscribed with the names of officers and men from the U.K and Commonwealth Forces who fell in the Ypres Salient and who have no known grave. Among the 55,000 names on the Memorial are 6,000 names of Australians missing in Belgium. Australia, with a population of under five million people in 1914, enlisted 416,809 men to serve in the First World War. Of this number over 60,000 were killed and 156,000 wounded, gassed or taken prisoner. During the Battle for Passchendaele in 1917 (Norman’s war) the allied forces suffered a total of 475,000 casualties. Of the Australian Forces 38,000 were either killed, wounded or missing in action. 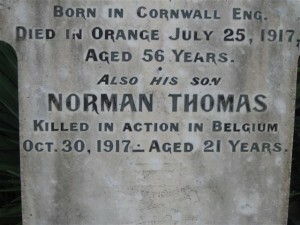 Norman is commemorated on the Methodist Church Orange Honour Roll and on the World War I Roll of Honour on the southern face of the Orange Cenotaph. He is also remembered on his father’s headstone in Orange Cemetery, Methodist Section D, Grave 10. In 1923 the Anzac Memorial Avenue of trees was planted along Bathurst Road to commemorate fallen WWI soldiers. A tree was planted in honour of “Pte N Trethewey”; it was donated by JJ Glasson. Very few of the trees are still standing today. I never knew him, but I know him; as his memory ever lasts. He sacrificed his life at war with honour and with pride. And the gun fire, mud and constant rain, were with him every day. But the life he gave, on the Western Front, was not to be in vain. No longer here but still with us, and remembered ever more. He gave his life so we might live; in peace and not in fear. Norman Thomas Trethewey memorial plaque. Image courtesy Orange Cemetery.